MELBOURNE, Australia -- Venus Williams will return from illness and her sister, Serena, will play Fed Cup for the first time in nearly five years after being selected to the U.S. team to meet Belarus in a Feb. 4-5 World Group II match at Worcester, Mass. U.S. Fed Cup captain Mary Joe Fernandez announced the team, also containing Christina McHale and Liezel Huber, late Tuesday. "I am looking forward to having Serena and Venus on the team for the first time since I became U.S. Fed Cup captain," Fernandez said. "They bring so much to this team, not only for what they can do on court, but the influence they will have on Christina and the rest of the team." It will be Venus Williams' first appearance in a sanctioned competition since the U.S. Open, when she revealed she had Sjogren's Syndrome, an autoimmune disease that can cause fatigue and joint pain. Serena Williams, who lost in the fourth round at the Australian Open, has not played Fed Cup since 2007. The 19-year-old McHale, ranked a career-high No. 42, will be making her second consecutive appearance and third overall for the American team. Her highlights last year included a win over No. 1-ranked Caroline Wozniacki at Cincinnati and a run to the third round of the U.S. Open. 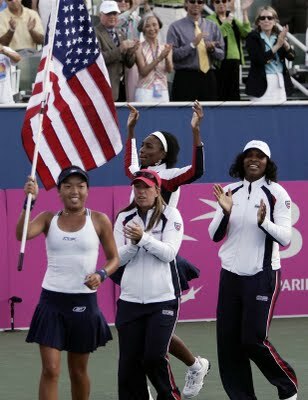 South African-born Huber, 35, has won six of her eight career matches for the U.S. Fed Cup team. The winner of the Worcester match will advance to the World Group playoff and a chance to compete for the Fed Cup title in 2013. Victoria Azarenka, who is expected to lead the Belarus team, will face defending champion Kim Clijsters in the Australian Open semifinals on Thursday. "Victoria is playing the best tennis I have seen from her, so we are excited to be facing Belarus in our first match in the United States in two years," Fernandez said.